When I was growing up, we usually enjoyed dessert only on Sundays and special occasions. We didn’t eat a lot of sweets throughout the week, so I always looked forward to Sunday. When fresh produce was available from the garden, we’d get home from church and feast on mama’s southern fried chicken, homemade biscuits, rice and gravy, peas, butterbeans, and corn. I can’t forget about the sliced tomatoes and cucumbers. Dessert was usually banana pudding or southern peach cobbler with homemade vanilla ice cream. These days, whenever I eat peach cobbler or banana pudding, I can’t help but think of mama. She made other desserts, like red velvet cake, chocolate cake with the best chocolate pecan frosting and pecan pie. But today we’re talking peach cobbler. Southern peach cobbler recipes differ from state to state and from cook to cook. The recipes may be slightly different but I’ve never met a southern peach cobbler I didn’t love. Some home cooks add a sprinkle of cinnamon to the top just before the cobbler goes in the oven. I don’t. Why? Because mama didn’t. My mom never cared for cinnamon or cilantro, but that’s another story. So, because mama didn’t use cinnamon in her southern peach cobbler, I don’t either. When peaches are in season, I sometimes use fresh peaches. When they’re not in season or I’m in a hurry, I use canned peaches in heavy syrup. 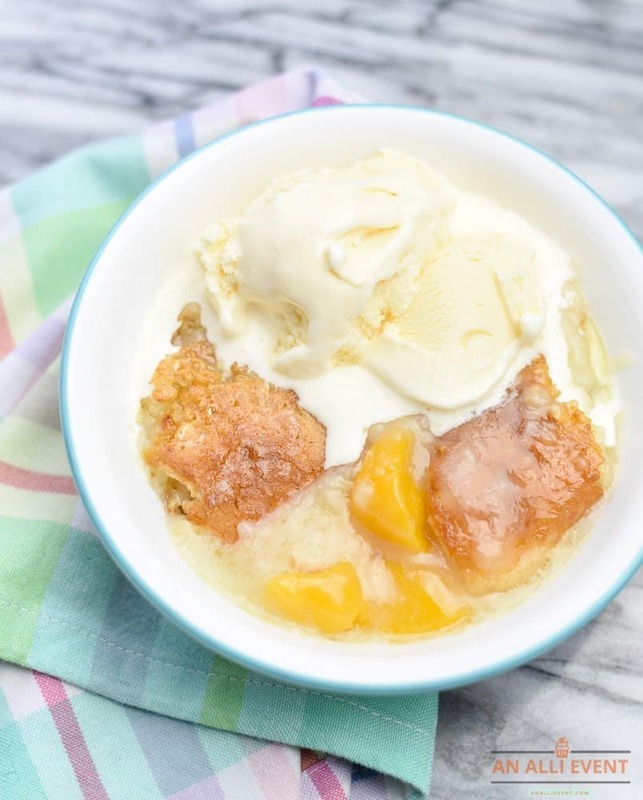 Southern peach cobbler is best served warm with a big scoop or two of vanilla ice cream. If using fresh peaches, peel and slice peaches. In a bowl, add the peaches and 3/4 cup sugar. Stir to combine. Preheat oven to 350ºF. Pour the melted butter into a 9×13 pan. Mix together the self-rising flour and sugar. Slowly, whisk in the milk. Pour over the melted butter. Don’t stir. Spoon the peaches over the flour mixture. Pour in the syrup as well. Don’t stir. At this time you can sprinkle lightly with cinnamon. As you know, I don’t add the cinnamon. I just added that bit in case you like cinnamon in your peach cobbler. Helpful Hint: If you don’t have self-rising flour on hand, make your own using plain flour, baking powder, and salt. Here’s how you do it. Pour melted butter into a 9x13 pan. Mix together the flour and sugar. Whisk in the milk. Pour mixture over the melted butter. Do not stir. Spoon peaches and syrup over the flour mixture. Don't stir. Bake for 40-45 minutes or until crust is golden brown. I think I’ll have a bowl of southern peach cobbler and take a stroll down memory lane – back to those Sunday dinners when I was a little girl. Yes, we called the midday meal dinner. And we ate supper every night at 5:30. That’s when dad got home from work. 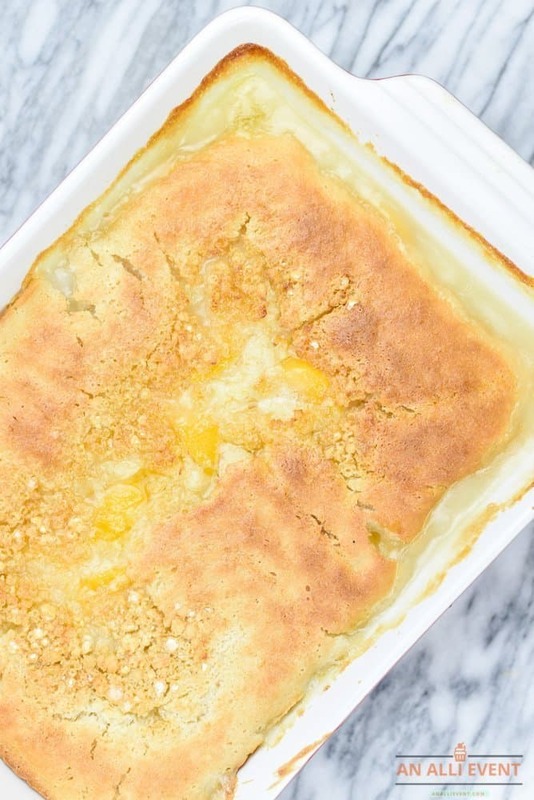 Whenever you’re craving peach cobbler, make this one. It’s amazing! Peach cobbler is such a southern dessert and we all know that southern food is the best in the whole country. Can’t wait to make this! I remember Sunday there was always a dessert made for that special day. We didn’t have dessert during the week unless company came over. We love peach cobblers from our peach tree. Finding your blog was perfect timing! I just bought some of my new favorite peaches and I wanted to find a recipe for Peach Cobbler. I did not know there was a Southern style of cobbler. Looking forward to trying this! Oh, my goodness! I don’t think I’ve ever wanted to make peach cobbler until now. That ice cream melting in a bowl of warm cobbler – drolling on my keyboard! Girl, you are my new best friend. Peach cobbler is my favorite of all time cobblers. You brought back so many happy memories. You made me hungry with the Fried Chicken and it is what we are having for dinner this evening and like you, it was a staple from my childhood. As for the Cobbler not so much but I might make it for my husband as he loves Peach Cobbler and all things Peach. Yum! This looks so good. Peaches are in season and I can’t wait to make this … I love cobblers much more than pies, and they’re easier to make as well! Well, I don’t think dessert could get much better than that! 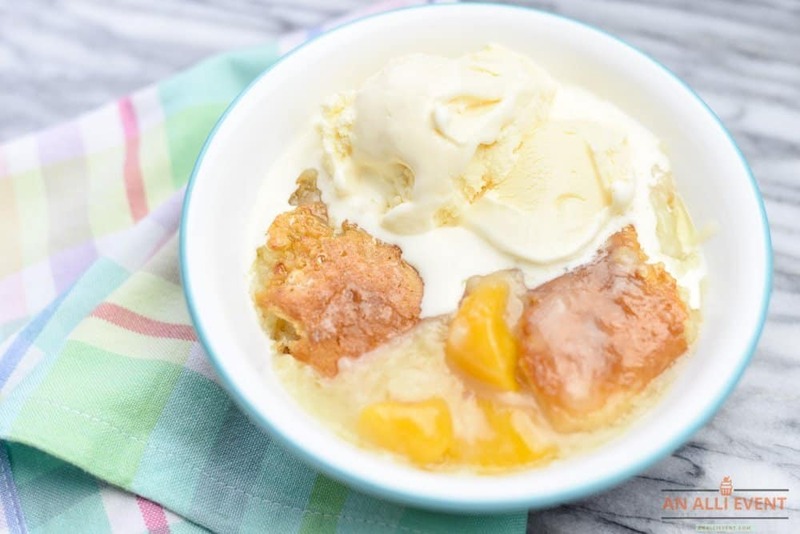 Ice cream and a great peach cobbler recipe-wow! This sounds so delicious and peaches are one of my favourite fruits! I will try recreating this recipe with non-dairy ingredients. I had a bunch of fresh peaches and just made cobbler last night. Topped with ice cream it was a great summer dessert. That’s the only way to make a peach cobbler in my opinion – by scratch! I have to find my Aunt’s recipe. She made the best…but I know your mamma did too!! Now this is the dessert to have at any gathering. I could really go for a dish of some! Ooh now this is one of my favorties no doubt. I have had plenty of cobbler to spot a good one! Nice work! A classic recipe that everyone loves. I agree that the recipe’s different depending on where you are. That’s why I love trying out different variations. This looks SO SO good and it’s great for the summer! Such a comfort dish! Oh my this looks AMAZING!! I love a good peach cobbler!! YUM!! This looks delicious. My great grandmother makes a really good peach cobbler. I love it, however, I can’t seem to get the recipe right. I have to give yours a try. 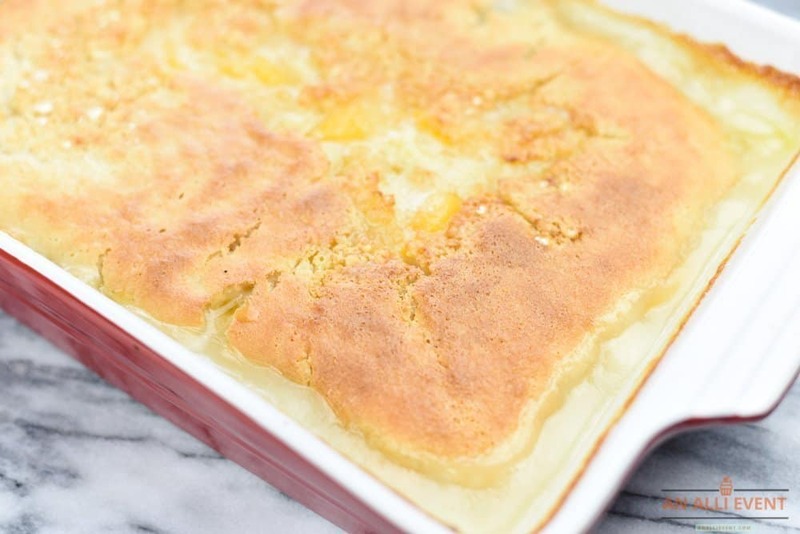 This peach cobbler looks and sounds so delicious.I would love to try this recipe. I don’t think I ever tried a peach cobbler! I’ve never had peach cobbler. I’m not sure why. I think I need to make it and see what it’s like. OMG! This made me crave really bad for some peach cobbler. Can’t wait to try this. It looks so delicious and quite easy to make. Will try to make one tomorrow if I can go out and grab some ingredients. I’m so glad he likes it! What is the size can of peaches? 15 oz. cans – I’ll add it to the recipe now. Thanks!